What Do Woodpeckers Eat & How To Attract Woodpeckers with food? If you plan to attract woodpeckers to your backyard it helps to know what do woodpeckers eat. 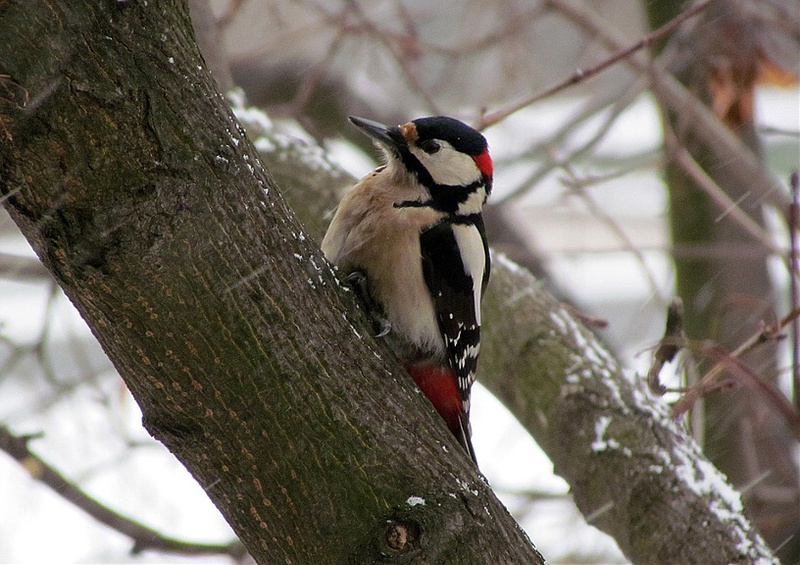 Woodpeckers are non-migratory species and tend to stay in the same area in all seasons. Most woodpeckers will have similar needs, but understanding how woodpecker food preferences change with season can help backyard birders met their nutritional needs. Providing the best woodpecker food at bird feeders benefits these birds just as the yard itself. Many people, and backyard birders alike can recognize distinctive woodpecker drumming, but what does it means? Woodpeckers drill holes in trees for the reason not so obvious to humans, and eating is just one of them. While some woodpeckers will try to find insects by drilling under the tree bark, most often it is related to as e mean of communication between birds. The male will often use drumming to signal other birds in the vicinity about his presence and claim the territory. Attracting mates in nesting season can be one more reason, and vigorous drumming can signal predators to move away. Woodpeckers will check every nook and crevasse of the tree for any hiding insects or hidden insect eggs, scout for berries in bushes and fruit trees. Woodpeckers don't eat wood like some people may think. If you hang a Woodpecker Bird feeder you can attract woodpeckers to your backyard. As the food source change over the year so does the woodpecker adapts to the environment. Their focus will shift on the food source that is the most abundant at the given time and place, as well their personal needs (like cold weather). In winter woodpeckers will look for nuts and seed to get energy and more fat, while in spring and summer high protein needs of growing hatch lings will require plenty of insects. Some birds species gather their food when sources are in abundance and stash it for the winter time when supplies are scarce. Chickadees, Blue Jays and Woodpeckers are known to behave in this way, and will hide food to retrieve it later. Acorn woodpecker is known to keep acorns in tree holes, it is not uncommon for them to stash hundred's even thousands. Other woodpecker species are known to bury seed and nuts in the ground to retrieve them later. Where and how you place your feeders is important to attract woodpeckers. Suet is best offered in autumn and winter. The best place to hang a suet feeder is next to or on a tree branch. Tube feeders can be placed on a similar spot, but make sure the feeder is designed to accommodate clinging birds. Woodpeckers like to cling on tree trunks, and will do the same on the bird feeder. If you provide nuts in the open tray feeder woodpeckers will gladly come and eat, what ever food you offer to woodpeckers you will probably see chickadees, nuthatches and other birds visit to grab a bite. Make sure your feeders are secured and squirrel proof. These birds are cavity nesters and will nest in Woodpecker House if you provide one in your backyard. Woodpeckers like other birds are common visitors to any backyard that offer the right food source. If you install the right bird feeder you will soon see a woodpecker fly up to it and checking it out to grab a snack. Red-colored-bellied Woodpeckers place eggs on bed of timber chips remaining after excavating cavity of nest. These nest slots are twenty two to thirty two centimeter in depth, using cylindrical living area of close to nine by thirteen centimeters. You can find Nests in deceased trees and shrubs (pines or hardwoods), dead branches of living tree, and wooden fence. The same couple might nest inside the very same tree every year, although sometimes excavate whole new cavity annually, often putting the newest one under the last year’s. Much like all of the woodpeckers, Red-bellied makes use of drumming sound as the main way to attract and communicate with prospective mates. This practice of drumming could be carried out on hollow branches, rain gutters, exterior siding, power posts, or other materials that it discovers resonates nicely for their needs. Similar to dismay of a person who actually wishes to "rest in" on week-ends or the evening shifter. Regarded as monogamous during the entire reproduction period. Some might develop couple ties lasting for several months. The strange element of courtship for this woodpecker varieties is nothing but the mutual tapping. Typically done in the potential nesting cavities, one particular bird will get inside while the other one stay outside and they will take the turns taping with other. Each female and male woodpecker will build home in shrub, (living or non-living) a power post or take control of other types of woodpecker’s home. These woodpeckers can even nest in human-made homes for birds. The Female can lay four to five white-colored ovum. One ovum is laid every day till clutch is over. Incubation is carried by each female and male and will remain for about twelve - fourteen days. The infant will fly through the home (fledgling) about twenty four – twenty seven days. In the northern parts just one brood might be brought up every year while in southern area two or even 3 broods can be brought up. These Woodpeckers might be seen in forest areas around the globe, other than Australia. Ivory-billed species of woodpecker got rediscovered from Arkansas in the year 2006. Experts say, there might be second populace within cypress woodlands from Florida’s panhandle. Red-colored-cockaded woodpeckers might be found within southeast of USA from The state of Texas up to Atlantic Shoreline as well as north side of Virginia. Woodpeckers with red head got reduced 2 Percent every year since 1966 till 2014, causing a cumulative drop of seventy percent, according to Northern US Reproduction Bird Questionnaire. Partners from flight quotes an international breeding populace of 120 thousand, with 99Per cent spending portion of that year within the United states, and 1% within Canada. This species rates 13 against 20 in the Continental Worry Rating. Woodpecker with red head is there on 2014 Status of Birds Watch Lists, that lists these bird species which can be in danger of getting threatened or vulnerable without preservation measures. This type of species are also the part of list, nearly threatened in the Red List of IUCN. These species of woodpeckers were ample during 19th century, possibly because the country experienced much more fully developed forests having nut plants and deceased trees and shrubs.